Torrle and Meseha were born on Scign to a pair of financially deprived people. Poor as proverbial dirt (and aproximately as ignorant) it took Raeo and her husband, Drinon six years to realize that Meseha was a mute. The only communication he seemed to be capable of was a throaty laugh and hand-signals. Torrle would later be able to tell them that the only one Meseha could actually speak to was the twin's traditional guardian, Castor and Pollux, a Troy-Serpant. The mute twin could command his protector to do most any task it was capable of completing. Just before their seventh birthday the boys were sent, via charity monies, to a special education program in Kryss on Lois. Torrle seemed to be very bright and later entered Kryss University. Meseha became an eloquent writer and worked on KU's newspaper as an honorary student. The two boys were very close, but prone to spats, especially when Torrle "got" a chick and Meseha was jealous. When the topic of the mission arose Meseha was excited, he wrote long letters to his brother, trying to convince him that it would be the most amazing experience. Torrle was skeptical but agreed to join the party because he could see how much it meant to his twin. Torrle, as the eldest, had recently recieved news of his parents' demise in a massive flood and decided that since there was no one at home to return to, a future in the bleak new galaxy seemed...do-able. 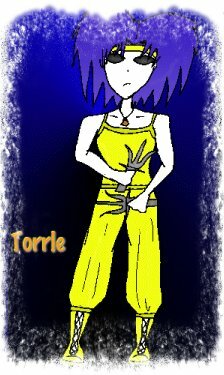 Appearance: Torrle is a tall member of his race, with long, somewhat spikey blue hair. His skin is almost transculently white, no blemishes or scars. Torrle wears an outfit somewhat like "jams" and tanktops at school, but he changes to slacks after joining the party. Typically they are black outfits with khaki colored pants, but when he's "going to battle" he'll wear his traditional color of yellow, including a bandana. He doesn't smile, unless trying to "impress" a girl. His face is long, his arms are strong, and his favorite expression is a nasty sneer. ...........Meseha is the exact same height as his twin, with the same long face, strong arms, pale complexion, void eyes, and a slightly lighter shade of blue. Meseha has always dressed in plain clothes, never opting for the cool duds of his brother, and therefore had no trouble adapting to the tan shirts and black slacks Torrle purchased for the journey. Meseha's traditional color is orange, and he seems to hate the color. His only truly distinguishing characteristic is the double-headed serpant that guards him (its a traditional gift for any twins born on Scign). Each head has a name, Castor and Pollux, and a personality. Meseha finds Castor to be the smarter of the two, and the more violent. Pollux is quieter, less likely to attack unless under Meseha's direct order. Weapons: Torrle uses the War Forks, a pair of telekinetically manueverable triotons used in battle on Scigna. He also wears the Fire half of the Fire & Ice crystal around his neck. ...........Meseha has only his half of the Fire & Ice crystal (Ice), and his Troy-Serpant (with Life/Soul at the base of its two heads with Wind/Water for Pollux and Terrain/Flora for Castor). ...........Meseha doesn't use the Ice so much as he likes to have Castor & Pollux attack physically. 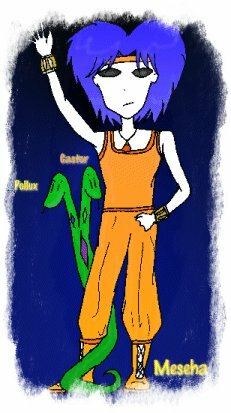 ...........Meseha would consider Castor & Pollux as his "talisman". ...........Practical jokes, the fact that he & Torrle fought a long, drawn out civil war upon their planet.